In a large heavy-bottomed pot, heat 1 Tb oil over medium-high heat. Dust lamb with flour and add about a third of the lamb to the hot oil in the pan and sauté until browned. Remove from pan and set aside. Repeat process two more times with the remaining oil and lamb. Set all cooked lamb aside. Turn down heat to medium, add a little more oil to the pot if needed, add the diced onion and carrots and sauté for about 5 minutes, or until onions are lightly browned. Add minced garlic and dried thyme, stir and cook for another minute. Turn heat back up to medium-high, add beer and stir until slightly reduced. Add potatoes, lamb, and beef stock. 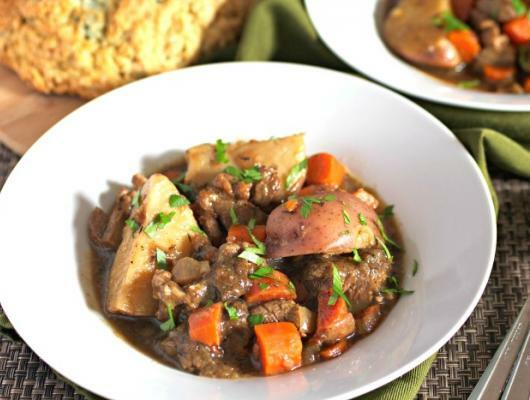 Bring to a boil then reduce heat to low and simmer for 2 hours, or until lamb is very tender. Enjoy with some soda bread or spotted dog and extra bottles of stout beer! 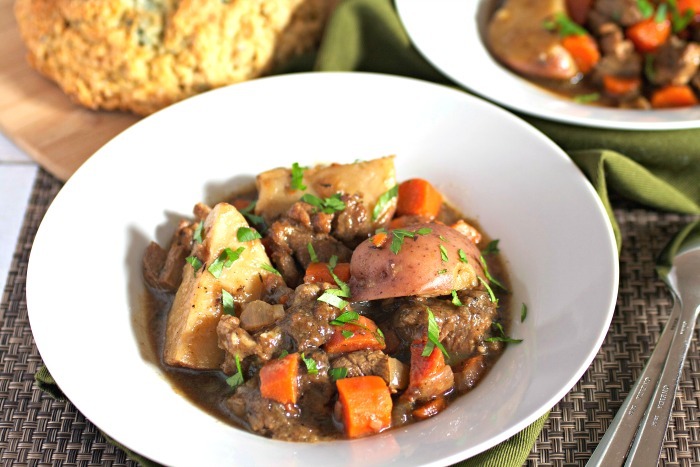 Celebrate St Patrick’s Day with a hearty Irish Stout Lamb Stew that’s slow simmered on top of the stove with red potatoes, carrots, onions, and a wonderfully smokey stout beer.